Durable Squeaky Dog Toys. Highly Rated and Enjoyed by our Furry Friends. There aren’t many squeaky dog toys out there that can be classed as durable. I’ve tried to bring you the best of what’s available, to last longer than most. However, for really tough chewers, please go to my toys for aggressive chewers. They won’t squeak, but they are the best bet for finding longer-lasting chew toys for your dog. As you would expect from any dog toy branded with the KONG name, this one is also designed with durability in mind. A rubbery texture the dumbbell will bounce, sometimes all over the place! The squeaky part is housed in a recessed and protected area, to help it last longer. The unpredictable bounce and squeaker make this toy a fun addition to your dog’s play chest. Durable rubbery material Great for indoor and outdoor use. Squeaker is hidden away more Harder to get to, this squeaker will undoubtedly last longer than most other squeaky toys. Interesting, dumbbell shape Can bounce all over the place at funny angles, to help keep your dog on their paws! WHAT ELSE IS GOOD ABOUT IT? Some dog owners have reported that this toy has helped clean their dog’s teeth! This is due to the mouthing action to get the squeaker to make a noise. IS THERE ANYTHING THAT’S NOT SO GOOD? It’s not a chew toy! Yes, it will last longer than most other squeaky toys, but if your dog prefers to chew, rather than play, this is not for them. Shaped like a classic bowling pin, this toy is perfectly shaped to be squeaked in a dog’s mouth. It’s made from rubber, and designed to be tough. Durable squeaker More noise for a longer time! Walter’s owner (65 lb rescue pit bull) came up with a great idea once the squeaker dies, as they inevitably do with time. He suggests placing a large dog treat in the space where the squeaker is housed. i.e. take the squeaker out and replace with your dog’s favorite treat. Makes for even more fun! I am suggesting this as a squeaky dog toy that is more durable then most, not as an indestructible chew toy. If you want something tougher for chewing, please check out my suggestions for aggressive chewers. This is my own tip when starting out – hold onto your dog for the first few times until the ball has been released, so they can understand what’s happening and the ball doesn’t hit them square in the face. Basically a trio of fun textures and sounds! There are two balls within the fabric toy, one of which houses a squeaker. It might sound like it’s a bit flimsy, but the fabric is actually a reinforced nylon, which is super durable. The extra dangly bits, which look a bit like tentacles, add another dimension of fun, particularly when the toy is thrown through the air. The Wubba toy can float, so fetch in the water is an option too. Lots of dogs enjoy taking part of the toy in their mouth and flinging it from side to side, and this toy copes with that well. You will notice there is a common theme throughout this page, and here it is again, this is not a chew toy, so don’t buy it if that’s what you and your doggies are looking for. Beware of knockoffs! KONG is a world-famous brand, and as such there will always be manufacturers who try and copy these. Make sure you order the Wubba that has the KONG brand attached to it, and don’t buy something that’s just called “Wubba”. Just on a personal note…Amazon is getting HUGE now, and I keep seeing this happening . 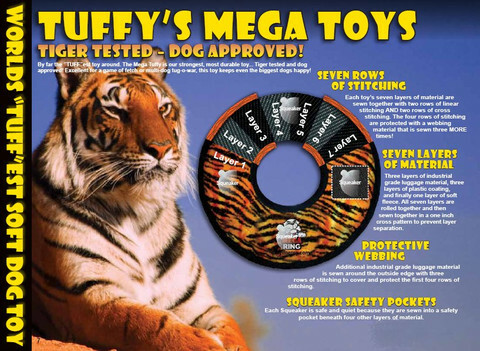 Customers are attracted by cheaper pricing on imitation dog toys, that copy the originals. They usually find the quality is not as good, and as a result are disappointed with their purchase. When they go back to review the product, some of them are leaving their reviews on the original product – not realizing that there are copies as well. This is really not fair on the original products, so I urge you to take care when purchasing, and take your time to establish what is the “real deal” and what is not. Genuine manufacturers usually stand by their products, have good customer service and want you to be pleased with your purchase. I hope you find these squeaky toys good for your doggie family. As always, I welcome your comments or feedback, and especially any toys that you have found really good or really poor. Let me know what you think below. Although both my dogs are gone now, it was always a struggle to buy them toys. One dog was a very aggressive chewer and the other had bad teeth from neglect of the previous owner. The only thing I found to satisfy both of them was cow bones. My chewer couldn’t destroy them and my little one liked to lick them. My vet always warned me not to leave the bones or any other toys out when the dogs were unsupervised. I always found this to be excellent advice since dogs are like having perpetual 2-year olds. Enjoyed the article. Thanks for sharing. Hi Sophia – yes it is good advice not to leave dogs unsupervised with any type of toy that might be an issue for them. Bones definitely fall into that category, as they sometimes splinter and can get stuck in their mouth or throat. Thank you for visiting my site and hope to see you here again soon. All the best, Mara.